Last month, Biofuelwatch joined a delegation in Chile coordinated by the Campaign to STOP Genetically Engineered (GE) Trees to investigate the impacts of industrial tree plantations and share information about the threats posed by GE trees. Given growing calls from the UN and other bodies to greatly expand the supply of wood-derived bioenergy in global markets, our delegation sought to better understand the impacts of tree plantations in a country often referred to as a model by the forestry industry worldwide. Chile’s forestry policies date back to the right-wing coup of 1973 and subsequent military dictatorship, which saw the Chilean government work hand in glove with local oligarchs to subsidize the expansion of plantations, and neutralize opposition by communities fighting to defend native forests and territories. The delegation, which included researchers and activists from Brazil, Uruguay, Chile, New Zealand, and the US, found that despite the formal return to liberal democracy, Chile’s forestry policy framework remains largely unchanged. 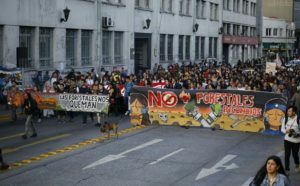 Rural and Indigenous communities, primarily in Chile’s central-south region, continue to face off against the encroachment of pine and eucalyptus plantations, backed by powerful financial and political interests. What has changed is the rapid onset of climate change, leading to a growing water crisis for communities in the plantations zones. Eucalyptus and pine plantations act as sponges for water, causing streams and rivers to dry up, and mining groundwater to the point where wells are running dry. Many rural communities in these zones are literally surrounded by plantations, which are also highly flammable. This January and February saw record wildfires tear through the Chile’s central-south region, killing 11 people and destroying 1600 homes in rural areas. We met with two families in a small community outside of Concepción which was devastated by fires, blackening the landscape. One family described the process of abandoning their home in the middle of the night to escape the fires, while the other lost their home, gardens, and orchards, leaving them with little to work with. The story was similar in the area around Temuco, where the growing water crisis is forcing Mapuche community members to leave the countryside and migrate to the cities to find work. 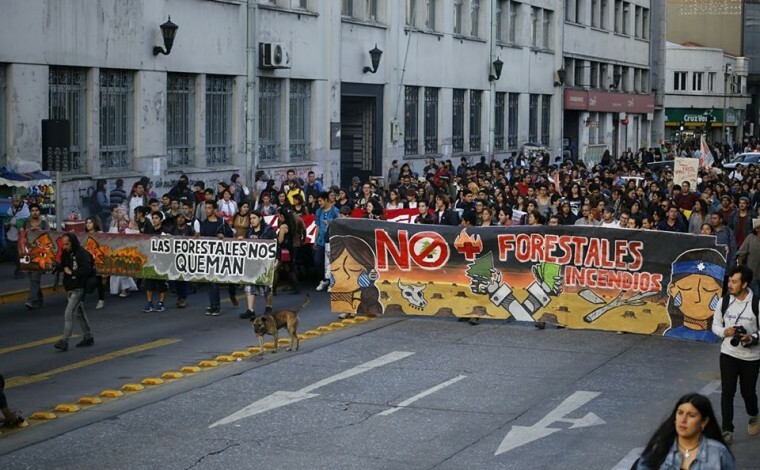 In response to these crises, Chilean social movements have been mobilizing, including an unprecedented national mobilization on March 14th calling for the end to state subsidies for the tree plantations industry. Organizers are also gearing up for the fifth annual March for Water and in Defense of the Land on April 22nd, which will be held this year in Concepción, in the heart of the plantations district. The University of Concepción is also set to host the premier international gathering of GE tree proponents this June, known as the IUFRO Tree Biotechnology 2017 conference. The university is home to a consortium including the two largest forestry companies in Chile, focusing on developing GE eucalyptus and pine species for use in the plantations industry. In our presentations and conversations across the country, everyone we spoke with immediately recognized the threat that faster-growing, herbicide and pesticide-resistant trees would pose in exacerbating the issues engendered by the plantations industry. Rural communities in Chile and across the world face a similar threat from the expansion of industrial scale bioenergy, which is being falsely promoted by multilateral agencies as a solution to the climate crisis. While much of Chile’s current harvest is destined for pulp and paper, the large-scale adoption of proposals such as large-scale pellet or woodchip production in South America for bioenergy would accelerate the economic drivers behind plantation expansion, land grabs and loss of native forests. In any case, governments and civil society organizations would be wise to learn from the experience in Chile, and focus instead of supporting rural and Indigenous communities innovating with agroecology, solidarity economies, and restoration of native forests. Biofuelwatch is a member of the steering committee of the Campaign to STOP Genetically Engineered (GE) Trees. Click here to read the CSGET delegation’s multimedia blog from Chile.